This single-level paired villa is fabulously situated in a quaint maintenance free community in one of the best locations around: the University Pkwy Shopping Corridor! It's also convenient to I-75, downtown Sarasota to enjoy many various art venues, Lido Beach, St. Armands Circle, a great variety of restaurants & abundant shopping. The lovely grounds are kept up exceptionally well with mature lush landscaping. This unit is steps away from a large screened community center with heated pool, spa & an activities area, as well as having one of the most serene natural setting & private views. It's on a cul-de-sac too. The shingle roof was replaced in 2018. The second bathroom has a new vanity. There's brand new carpeting in both bedrooms & interior painting was just done. 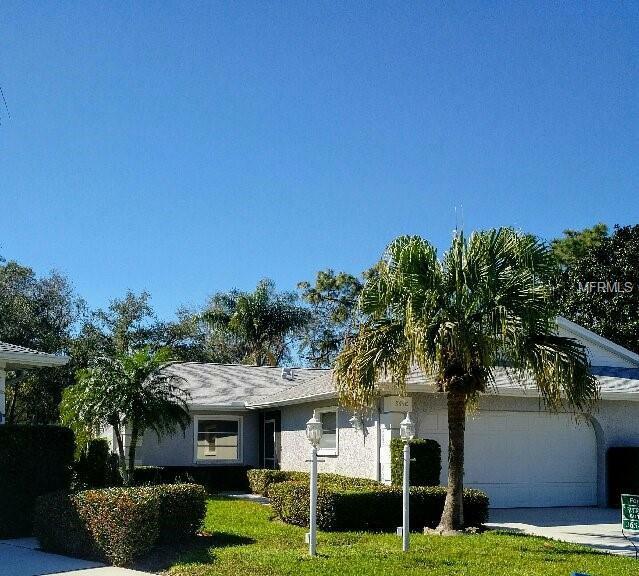 There's an open spacious feel to this neutral decor 2 bedroom / 2 bath + generous bonus FL/sun room villa & the living/dining area's ceilings are vaulted. Both bedrooms have walk-in closets too. The screened breezeway from the 2-car garage to the front door is covered in case it's raining. The kitchen has an eat-in area & closet pantry. There's an open concrete patio for grilling out in back. The community is professionally managed & the association fees are low. One of the rare pet friendly areas that will accept up to 2 pets, as well as larger dogs - contact the association manager for specific details. The property is being offered "as is - with right to inspect." Listing provided courtesy of Evergreen Realty Corp.
© 2019 My Florida Regional Multiple Listing Service, Inc. All rights reserved. All listings displayed pursuant to IDX. All listing information is deemed reliable but not guaranteed and should be independently verified through personal inspection by appropriate professionals. Listings displayed on this website may be subject to prior sale or removal from sale; availability of any listing should always be independently verified. Listing information is provided for consumers personal, non-commercial use, solely to identify potential properties for potential purchase; all other use is strictly prohibited and may violate relevant federal and state law. Data last updated 2019-04-23T20:47:07.243.